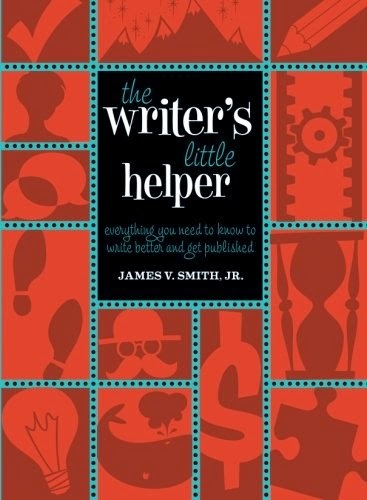 James V. Smith, Jr.’s The Writer’s Little Helper is a great little reference book for writers. It consists primarily of short (most under 4 pages) discussions of problems and situations that novelists face, along with easy to understand suggestions for getting past them. It’s one of those books that you can sit down and read for hours if you have the time, or (owing to the brevity of the sections) just a few minutes. In the section entitled “Imagery Versus Description”, Smith begins by saying “My advice: Never write description. Description implies stopping the story to write colorful stuff. Instead, create powerful imagery which suggests keeping the story in motion using those images to pump up the action, conflict, and dialogue.” He then shows examples of how to do this, by weaving the description into the action, incorporating images into the action, seeing through the character’s eyes, using tiny but telling details, choosing action-bearing verbs and non-verbs, inventing fresh viewpoints, and creating an image without saying so. He not only provides examples of how to do these things, but explains afterward how the technique was used in the example. His suggestion in “How to Write a Bestseller” is an interesting one. He tells you to take your favorite bestselling author’s novel, and copy it word-for-word by hand on paper. Why? Doing this, Smith says, can teach you simple mechanics like punctuating dialogue. It can help you see more clearly how the author uses imagery, describes action, and writes dialogue. You may even begin to see how “every word serves a purpose in a best-seller, carrying the freight without detours. In short, you learn how not to waste your own time and words.” Smith suggests taking notes as you copy, to jot down the lessons you learn from the author’s work. You should also stop periodically and try to write a similar scene yourself, using what you’ve learned. The other sections of the book cover characterization, editing, beginnings and endings, point of view, word choice, dialogue, pacing, plot, writer’s block, and getting your work published. Depending on where you are as a writer, you’ll find some topics more helpful than others. You may find some to be completely useless, and others to be eye-openers. Personally, I found most of the book to be filled with easily-digested, useful ideas and “things to ponder”. The Writer’s Little Helper would make a great gift for a friend who is thinking about writing a novel, or someone who’s struggling with some part of their story. It’s also a great reference to flip through occasionally, just to remind yourself of techniques you’ve mastered and to get you to think about those you may not have mastered. It’s also a relatively inexpensive book, which is a bit unusual for a modern hardcover.